On one occasion Peter and John were going up to the temple in Jerusalem to pray as they were accustomed to do. When passing by the temple gate they happened upon a lame man. And this was no ordinary lame man. The Bible tells us he had been crippled since birth. It’s all he knew. No walking…ever. Just a life of sitting by the temple gate begging, surviving off the charity of others. So when he saw Peter and John walking by what do you think he asked for? You guessed it…money. We can’t fault him for that. It’s what he did all day every day of his life. I mean a lame man has got to eat too, right? What else did he have to look forward to? It would have been real easy for Peter and John to drop him a few coins and be on their way. I’m sure they had some pocket change they were carrying around. The man would have been thankful that they met his daily need for food. And Peter and John would have felt good knowing they helped somebody. But Peter had no interest in giving money to this man. He had something else in mind…something bigger…something deeper than the perceived immediate need. 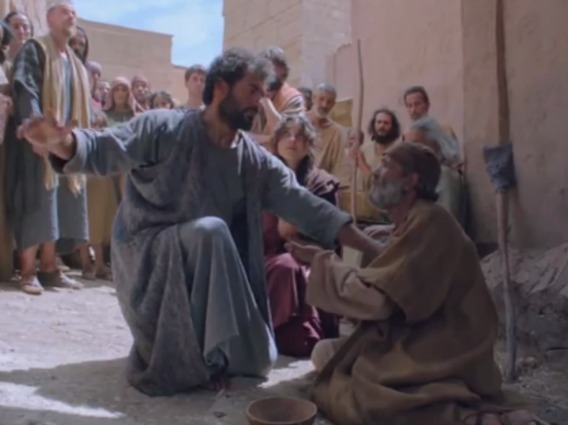 “And fixing his eyes on him [the lame man] with John, Peter said, ‘Look at us.’ So he gave them his attention, expecting to receive something from them. The lame man couldn’t see his true need. Even if he did see it he had no hope it could be changed. People didn’t recover from lifelong ailments in those days. Peter saw the deeper need and gave him a gift that would keep on giving. Not only did he change this man’s life by giving him the gift of mobility, the miracle impacted those around him. We read a few verses later the entire city was filled with wonder and amazement for they all knew this man’s history. If Peter and John had only thought about giving money, they’d quickly done so and been on their way. they would have missed the chance to truly alter one life while simultaneously impacting thousands. So the next time you are contemplating giving money, give it a second thought. It may be money is what’s called for in that situation. It may be that it’s not. Meeting the deeper need is always what’s best. It will have the most lasting impact and may multiply in ways you could never imagine. Questions: Do you know people who are looking past the deeper need and only focusing on superficial issues? How do you go about helping them? Have you ever had a time where someone gave you something besides money…How did that impact your life? Sometimes it is hard to feel the true need in giving money. That said, I try to weigh the situation if I have to so that the money I’d be giving is more useful. Or, I try to be as helpful as possible. Money could be not what they need but others such as food, clothes, or something. I don’t know why, but I thought back to the days of hurricane Katrina. The area I was in during the aftermath expected to see lots of refugees. It was easy to think they just needed some temporary shelter and a little cash. Instead, people I knew were finding jobs that fit the refugees’ skill levels. They found clothes. They asked for loaner cars. There was a push to help the refugees connect to a new community, for however long they were there. Money was great, but I don’t think any refugees had to use it there – it was a gift for when they finally got to go back home. Instead, our community was focused on meeting the needs head on. I think what I’m trying to say is that money is nice when you are in need, but having people meet the needs directly is less stressful and more loving. In situations like that tangible needs are needed more than money. Makes me laugh when people talk about investing in gold in case there is a world crisis. No one will care about gold if the apocalypse comes. They will need food, water, shelter, provisions and will be bartering other goods to get those items. I had one friend who kept on borrowing money from me. At first I gave her some cash, but the next time she asked money from me again, I told her that I can teach her to look for an online job because she didn’t have any job. I have seen money be the ruin of some people. Not because they have too much, but because people would give it to get them to get them out of a situation all the time. That seems like a good thing, but many times you become an enabler. You are enabling them to continue making bad decisions by teaching them someone else will fix your mistakes. I have a family member who means well, but owes a lot of money to a lot of family. They would make dumb decisions, and need help that is almost always money related. He owes his dad nearly 30,000$ for paying off his credit card debt, and has no plans to pay it back. He has a repo, owes several banks for overdrafts and never paying, plus letting credit cards go. He owes a family member 600$ for bailing him out of jail due to a 20$ bounced check he thought was taken care of. He has ruined many cars by driving them like they will never break. He isn’t responsible with what he has. He is in his early 30s, married, with four children. He at least knows how to keep a job. It’s a hard call to make, especially when they are close. However, sometimes, they have to face their own choices to learn to stop getting into those situations. The best thing is to force them to face those decisions early on before more people get involved, and make it nearly impossible to do. For instance, when children get involved, its hard to let someone fail to learn a lesson, because the children will suffer too. My opinion is his parents should have made him pay back that debt, or better yet monitored his spending while he was still under their roof to teach him to face his choices. Instead, he has always been bailed out by someone else. He has yet to learn. It isn’t all his fault, but it was all his choices. Money is like a scalpel. It doesn’t do the repairing, but it is part of the process. The doctor is who does the repairing by using the tool in the right way. When you use it the wrong way it can cause a lot of harm, but always remember it isn’t the tool’s fault. The more meaningful gift would have been a lesson in responsibility, not paying them off. Meeting a deeper need is often more meaningful than providing money. Also, if you simply aren’t in a financial position to give money, it is good to know that giving your time is beneficial too. That’s true Ali…it doesn’t always have to be about money.